The whole counsel of God, concerning all things necessary for His own glory, man’s salvation, faith and life, is either expressly set down or necessarily contained in Holy Scripture: unto which nothing at any time is to be added, whether by new revelations of the Spirit, or traditions of men. Nevertheless, we acknowledge the inward illumination of the Spirit of God to be necessary for the saving understanding of such things as are revealed in the Word; and that there are some circumstances concerning the worship of God, and government of the Church, common to human actions and societies, which are to be ordered by the light of nature, and Christian prudence, according to the general rules of the Word, which are always to be observed. The motivation of the Jew’s action is plainly jealousy, nothing more. Of course they did not embrace the message: if they had, they would not have been jealous! Why make a point of this? Thank you for this post. It is very timely. Today I spent two hours with a friend who did everything he could to undermine the priesthood, the eucharist, and the authority of the church. Much of the discussion involved the Bereans. It is not a coincidence that you posted this today. Thank you for your witness and for giving me strength to witness. You say, The motivation of the Jew’s action is plainly jealousy, nothing more. Of course they did not embrace the message: if they had, they would not have been jealous! Why make a point of this? That doesn’t make sense. Let’s look at the text. The word the Apostles preached. Because they searched in the Scripture to find the Apostles word therein. Here is what goes right past Protestants. They don’t even see it because of their presuppositions against the Traditions of Christ. 1st. 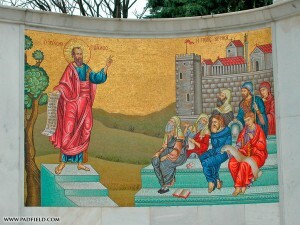 The Apostles were Teaching. That is the Tradition we call “Magisterium”. 2nd. I repeat, the Apostles were Teaching. That means they were passing down the Traditions of Christ by Word. That is simply called, “Sacred Tradition”. 3rd. The Bereans looked up the Sacred Tradition in Scripture. That is the Catholic Teaching of passing down the Faith of Jesus Christ by handing down Tradition, Scripture. That is what is depicted in the Berean episode. Not Scripture alone. So let me see if I understand: The doctrine of Sola Scriptura states that we should believe only those doctrines which are in the Bible; the doctrine of Sola Scriptura is found nowhere in the Bible; so…??? De Maria said the scripture contain Catholic doctrine so we must believe in Sola scriptura. We must also find whether un-biblical doctrines of Tradition found in the CCC need to castigated out. JOEL: STEVE RAY HERE. YOU ARE GETTING TEDIOUS AND OBVIOUSLY RUNNING OUT OF GAS. YOU CAN NEVER CONCEDE ONE POINT OR YOUR WHOLE HOUSE OF CARSS COMES TUMBLING DOWN. so we must believe in Sola scriptura. Huh? You mean after all the times that I’ve repeatedly said that Sola Scriptura is a false doctrine which contradicts not only Scripture, but itself, you come to the conclusion that I said we must believe Sola? There are not any un-biblical doctrines in the Catholic Church. There are several anti-Biblical doctrines in Protestantism. The Bible never stated that it is the final/sole rule of authority. It even points out that the Church has the final say. So you see the Bible does not teach sola scriptura. It is a man made tradition which is un-biblical. To understand and accept the truth you have the be intellectual and not emotional, that is how you will come to the knowledge of the fullness of truth.